he is shuffling round the ground next to the van, eyes firmly to the floor, occasionally bending ground ward before taking a few hurried steps in this stooped position, culminating in his victorious pursuit of a grasshopper, which he places in an empty two litre water bottle. Unero is a tall man, not fat in anyway but most definitely solid. He sports a moustache that dips down either side of his mouth. It is the sort of moustache that if he were to shave it off, you could imagine watching grow back to its identical shape and size within five minutes. The brown slacks that are just a little too short, and sensible brown leather shoes, both of which he wears everyday and in every terrain, somehow seem to suit him. he will hold the bottle of semi dying grasshoppers up proudly in the air and study it before rubbing his tummy, motioning a frying action and smiling broadly at Francis before placing the bottle reverently in the back of the Furgon. Francis has made frequent enquiries as to how they are best cooked and when we are going to eat them, even showing some enthusiasm for trying one. What has become clear is that Unero has no intention of eating a grasshopper but he does greatly enjoy the idea of us thinking he is going to eat one. Each day we travel a little further along our route and each day Unero dislikes photography a little more. What Unero likes is to travel from one point to another point, stopping for lunch at a point that is roughly in the middle of the other two points. He does not like me shouting ‘stop’ from the passenger seat every time I spot something that might be worthy of a photograph. We have fallen into a routine in the Furgon. Unero drives, clasping the steering wheel with both hands. With robotic regularity and accuracy, his right leaves the wheel and finds its way to a bag of sultana’s that sit between us. I hunch over the dashboard, scanning the landscape for photographic opportunity. Francis lounges in the back listening to podcasts on his i-pod. At least he would like to, but about an hour into each journey Unero decides to try the tape player. He has 2 cassettes and both are ancient. They seem to contain recordings of a Chinese mermaid. As the mermaids high-pitched offerings reach Francis’s ears his demeanour darkens, his hand immediately reaches for the volume on his i-pod. We both know this is a futile, volume alone could never drown the peculiar screechy tones of the siren’s song. It is only a matter of time before he de earphones and sits back sulkily. Conversation is limited. Francis and I speak no Mongolian and our Russian phrase book proves little help. What english Unero does possess is often emphasised by repeating the word twice: “Water, Water”, is his morning call for tea water, or he pronounces, very sweetly for such a big man; “Fank you”, “Sowwy ,Sowwy”. “Yamma”, Unero instructs without looking at the animal to which I am pointing. Unero nods approvingly without moving his eyes from the road. We repeat this process for every species animal we see…there are a lot of animals in Mongolia. “Tourist?” I question, I am not sure why, as it is immediately obvious and Unero has already stated this as a fact. “Tourist” Unero confirms, his eyes now conveying a look of utter disgust that there should be foreigners in his country. Three days into what should be a twelve day trip and I am becoming a little anxious. I had foolishly convinced myself that Mongolia would be a photographic paradise; point the camera in any direction and award winning shots would throw themselves at the lens. This has not proved to be the case. What has proved to be the case is three days of grey, overcast, rainy, weather; hundreds of miles of flat featureless landscape that somehow don’t even lend themselves to barren vastness imagery. At our first camp we made friends with a dog. It hung round our tents all night, snarling, howling and whimpering as it was repeatedly mauled by another pack of dogs; by morning it could barely walk and was bleeding from several deep wounds. On the second day our luck seemed to have turned when we spotted some nomadic people skinning a goat, but I am told in no uncertain terms not to photograph and to leave. My anxiety mounts. At some time on the third day, after what seems like a week of nothingness, in the distance, I see a group of Gers (yurts) surrounded by horses and camels and a group of nomadic people appear to be roping the camels. “Picture? Picture?” Unero queries, looking annoyed at yet another interruption to the journey. “Yes” I reply and point to the Gers. Briefly he stoops his head to get a better view through the windscreen and assess the intended subject before begrudgingly redirecting the Furgon. As Unero brings the Furgon to a standstill, camels and nomadic people alike pause and crane their necks to determine what manner of disturbance we are. Unero leaps from the Furgon and exchanges a few words of Mongolian with the herders. They look at each other before throwing him a rope. Unero proceeds to bring down a camel. Francis and I look at each other in surprise, neither of us have seen a man in brown slacks bring down a camel before. We decide it might be time to take some photographs. The Shot: Photography is as much about the photographer’s people skills as the photography. When you walk into a situation like this one your cultures are totally different and you only have limited time to photograph. It is difficult to negate turning the whole event into a circus. In this particular incidence we did not totally achieve this but we did our best to build a relationship with the people we were photographing. This put them at ease with our presence and allowed them to get on with their work without feeling inhibited or self-conscious. On this occasion, putting the nomads at ease, involved me agreeing to a wrestling competition and several arm wrestles. 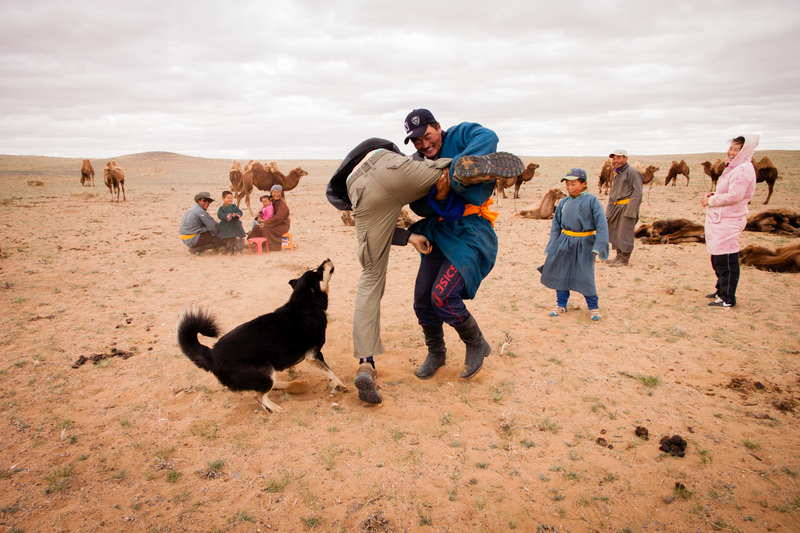 The wrestling nearly ended is disaster when one of the nomads dogs bit me, if it had broken the skin we would have had to turn round and returned to Ulaanbaatar. I thought it best to lose…in order to ingraticate ourselves….obviously I could have won if I had wanted!!! This entry was posted on June 18, 2014 by laurienoble. It was filed under Mongolia and was tagged with Camel Hearders, Camels, Canon 1DS III, Canon 5D III, Furgon, Ger, Horses, Lowepro CompuTrekker, Mongolia, Mongolians, Nomadic People, Nomads, Nomads Tours & Expeditions, Wrestling.